I had a very difficult time naming these cookies. Even before I made them, I was coming up with names in my head, trying to figure out a clever title worthy of these clever cookies. A little light flashed in my brain. 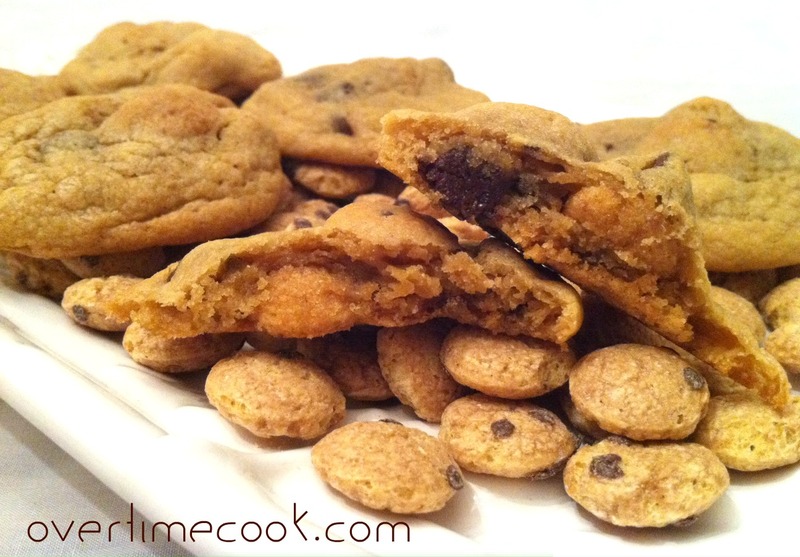 How awesome would it be to bake chocolate cookies with little chocolate chip cookies in them? Naturally, I had to find out. I bought a box and brought it home. Then a month of Holidays got in the way, and it wasn’t until last week that I had time to bake for fun and try new recipes. That’s when I finally made these. Then the naming dilemma really kicked in. I was going to call them Chocolate Chip Cookie-Chocolate cookies,that describes these cookies so perfectly but I didn’t want y’all to think I developed a stutter recently. (I haven’t developed a southern accent either. Hmm.) So the runner up was Double Chocolate Chip Crunch Cookies. This name does a pretty nice job of describing these cookies too. Soft and chewy, as most of us love in a cookie, but with some fun crispy bits for a nice contrast. If you think that was the end of the problems getting this post up…I wish you were right. The snow knocked down trees and power lines all over my neighborhood, taking my power and in turn my internet connection with them. I’m in Starbucks now, charging my laptop and phone and utilizing their internet along with about half of my neighborhood, or so it seems. Back to these cookies: the idea is simple. 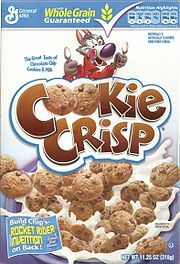 Make chocolate chip cookie dough, pour in a cup and a half of this cereal, then proceed as directed. So simple, so delicious. Preheat oven to 375. Line or grease cookie sheets and set aside. In the bowl of an electric mixer, cream butter and sugars until creamy. Add vanilla extract and eggs and beat until fully incorporated. Add flour mixture, and beat until just combined. 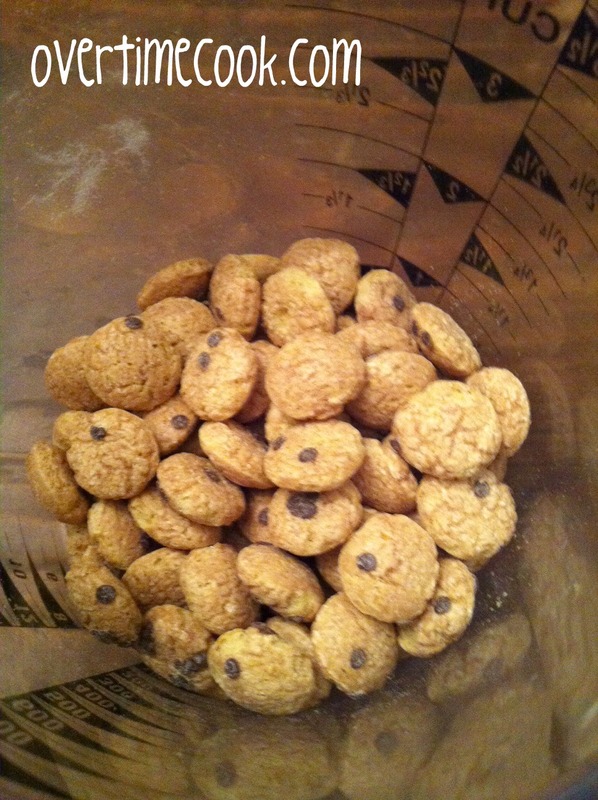 Using a spoon, gently stir in the chocolate chips and cereal. Drop dough by heaping tablespoons and bake at 375 for 9-10 minutes. Cool on tray for one minute before removing to wire rack to cool completely. Important note: don’t make these cookies too small, as the cereal is too large to work in small cookies, and the taste and texture will suffer. These cookies are awesome! I definitely recommend them. (If you have electricity to run your mixer and an oven to cook them in…) Thanks, Miriam. Sorry that you lost your power during the storm and hoping that everything is restored as soon as possible. I am impressed at your dedication-posting despite a power outage. These cookies were a big hit. I love your pictures. Much better then you know who. 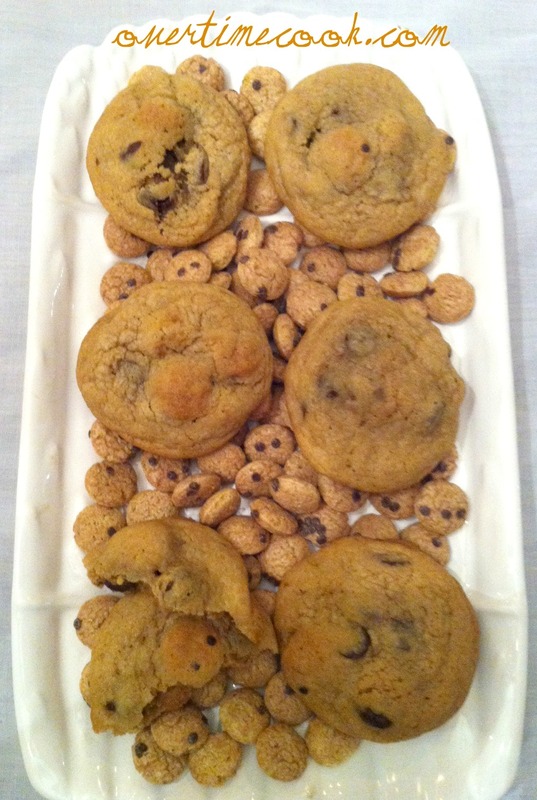 I’ve made cookies with crushed corn flakes (and butterscotch and chocolate chips) and they were delicious. Try experimenting with different cereals that you can get there. Great idea! I was reminded of that cereal in the grocery store the other day and have been brainstorming what to do with it. Love this. wow they look so so yummy. Woah, what a cool idea! I love creative desserts and this is such an original idea! I’m so glad you submitted these to the Chocolate Chip Cookie Challenge. Please add the graphic (http://bit.ly/OcBVgi) to your post and link it to this: http://bit.ly/QBNJJX. That way, we can keep the CCC love going and your readers can find everyone else’s recipes. Thanks! I love your recipes, and would love love them even more if you could put the quantity in your recipes. It would be so helpful to me. my computer and each time I have to change it to print it out. Thank you so much for sharing your creativity… going to the store now to see if I an find the cereal.